“Please walk on the grass.” That’s what the signs read at Gibbs Gardens. And of all the joys I experienced during a recent day at these magnificent gardens, strolling through the cool, soft grass barefoot was one of my favorites. 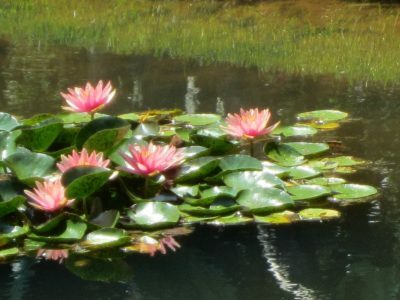 These magnificent gardens, just an hour north of Atlanta, are the kind of place you want to spend all day strolling around, take a break for lunch under huge majestic trees, then spend the afternoon meandering around the many paths through the 16 gardens. And that’s exactly what we did. Or if you’re like my passionately botanical sister-in-law Martiele, you stay until dusk falls, taking hundreds of photos and leaving only as the gardens close for the evening. The other ten of us left her behind, joking that we wouldn’t be surprised if she curled up under a tree somewhere and spent the night. 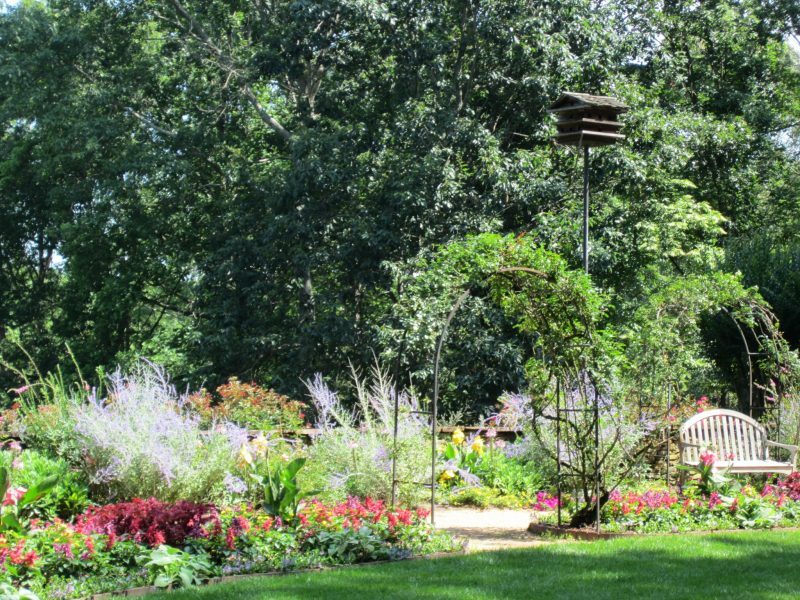 Whether your extent of gardening experience is once-a-year planting of something pretty and hoping it grows like me, or you know about every care and feeding of everything from hydrangeas to hibiscus Martiele, you’ll love your visit to Gibbs Gardens. After driving through the wooded path to the parking lot and buying tickets at the Welcome Center, visitors exit through the back where you’ll often find owner Jim Gibbs, eager to share with you the beautiful gardens. He searched for six years for a site to realize his dream of constructing these world-class gardens, which just opened to the public in March. He and his wife live in the home on the 292-acre property, which is sprinkled throughout with statues of his grandchildren at play. 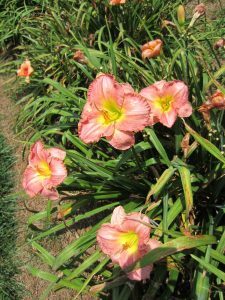 When a small group gathers, he holds up the colored map of the garden and points out the various areas, then informs you of the “specials of the day.” For our visit in June, our specials were the 1500 species of day lilies over three acres, and the 1400 hydrangeas. In addition to those, we wandered through the 220 acres of gardens, divided into 16 areas, included a gorgeous replica of Monet’s bridge at Giverny. With 126 benches, there are plenty of places to rest and contemplate should you wish. The gardens are so vast, it’s worth the $5 tram ticket to take you around when you tire or just want to travel from one section to another. One of the 2,087 photos my sister-in-law took after I left the camera with her. Good thing I brought an extra battery. Be sure to spend lunchtime there at the Arbor Café where you can pick up a delicious sandwich from a local bakery and enjoy it in the shade of huge mature trees, a setting remniscent of the Tuilleries Gardens in Paris. The website has a bloom calendar so you can see what the “specials” might be before you go. I’m putting March 1 to April 15 on my calendar for a return visit for daffodil season. More than three million daffodils have been planted here over the past 20 years and now cover 40 acres. I can’t think of a better way to welcome spring. And to walk in the grass again of course. Gibbs Gardens, 1998 Gibbs Drive, Ball Ground, GA 30107. Open Wednesday through Sunday.